This is one of those books that has so many intertwining plotlines that I couldn’t possibly begin to write a summary. There’s a God that doesn’t believe in his own divinity, a princess forced to marry for the sake of her country, a sentient sword, a system of magic built on color, and a political climate aiming for war. A whole lot is wrapped up in here, and I’ve been discussing the book in detail for the last five weeks with my group read. In general, I liked Warbreaker, but it wasn’t nearly as good as other books by Sanderson that I’ve read. The thing I really like about Sanderson is the way he handles character. 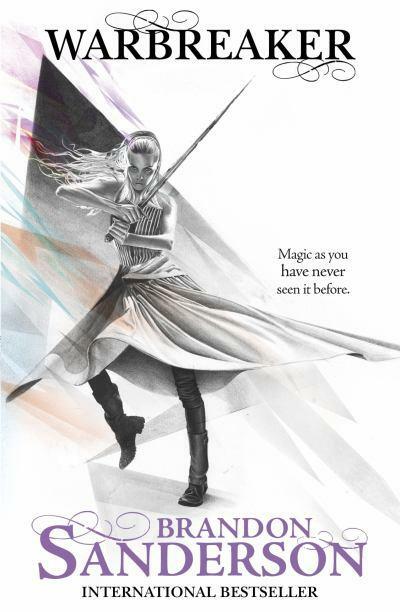 Warbreaker didn’t seem so focused on character, and in places it felt like character was sacrificed for plot twists. There were a lot of unanswered questions by the end, despite it being a standalone book, and I just wasn’t satisfied. However, Sanderson at his worst is still better than many books I’ve read, and I did enjoy reading the book. I just…wouldn’t recommend starting with this one, if you’re looking to give him a try. Three things to note (9/24/14): 1 – My original weekly group discussions have been unfortunately lost. 2 – Despite what I said here, this was actually the easiest/fastest book to get into of all the Sanderson books I’ve read, so it actually would make a good introduction to him in that way. 3 – Despite this not being my favorite during the initial reading, this is one that has stayed very powerful in my memory and has grown into a favorite in the time since. I do plan to revisit and re-review in the future. Note: This book was reread and rereviewed in Jan/Feb 2016. This entry was posted in 2012, Adult, Prose and tagged divinity, humor, memorable, speculative, WTF moments. Bookmark the permalink.